A simple but stunning sympathy to share with you today. 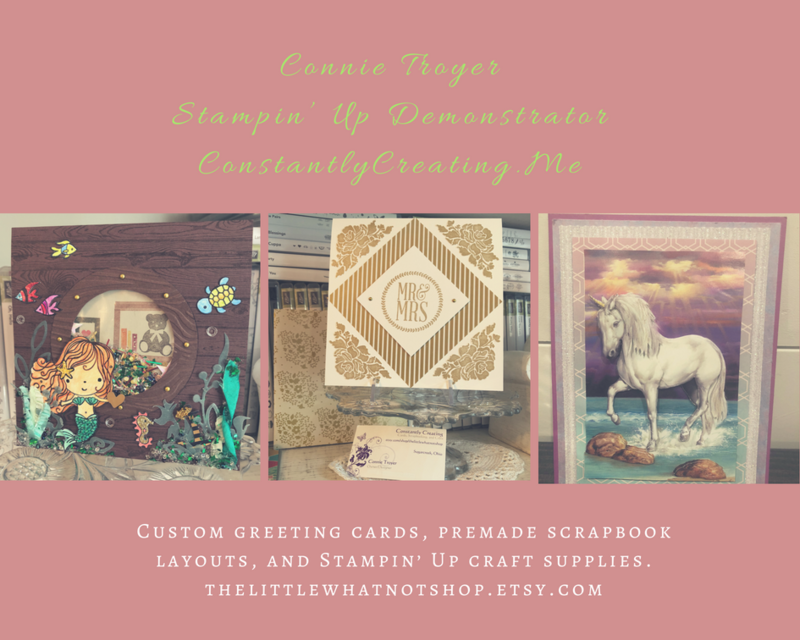 I’ve had a rash of sympathy cards to make lately, so I’ll be talking about those in several posts to come. They are all very different and more of a clean-and-simple idea than ones that are overly complicated. The one I want to show today was created with a base of 80-lb. weight retired Stampin’ Up Marvelous Magenta cardstock, which matched the main lily design perfectly. It is an A2 size (so 4.25″ x 5.5″). I cut a piece of retired SU Fabulous Foil Acetate to fit the size of the card front and then glued it with Tombow Multi-Glue (green-and-white bottle) under where the lily block would be attached. The acetate is freestanding otherwise. It is accented with silver on one side and gold on the other. The gold happened to match the warmth of my green better (and my sentiment was also in gold). I “cheated” a little bit on this card by using a some preprinted materials. (Isn’t that what patterned paper is, though?) Specifically, I can confess that the magenta/lime/white lily piece is the front of a pocket calendar, cut down. I never would have guessed, myself, if I looked at this card for the first time. The block was just too pretty to toss, so I cut off the wording, squared it up, and found things that matched. Luckily for me, one of Stampin’ Up’s current In-Colors, Lemon Lime Twist, also matches perfectly, so I matted the calendar piece with LLT cardstock. Then, because I was once again short on time (chronic problem), I dug through some Anna Griffin sentiment pieces I’d acquired secondhand. The lime green oval mat is a separate piece from the gold-foil sentiment, but they coordinate perfectly. And using them was faster than stamping my own. I popped up the top oval with Stampin’ Dimensionals and remembered that I had some matching In-Color felt bows from the last catalog. Raising up the top layer allowed me to nestle that bow knot right beneath it rather than stick up in its own layer. For the inside, I used a leftover strip of the Fabulous Foil Acetate and a Hero Arts set of sympathy stamps that is one of my favorites. I turn to it often. “Sending caring thoughts your way” was stamped in SU Lemon Lime Twist ink, and the flower stamp from the same stamp set was colored with Marvelous Magenta and Lucky Limeade markers on a piece of white paper that I cut to fit the inside. Clean and simple but elegantly stunning at the same time. It’s prettier in person, even though I did some “recycling” by using the calendar piece. Anything is fair game to go on a card! Thank you for stopping by and reading! Leave a comment if something I did inspired you!